After months of waiting and guessing, the first part of the last movie of the Harry Potter saga is finally here. As soon as I found out the timings of the movie and got together some friends, I managed to get permission from my parents, and went off to the cinema. My heart was fluttering slightly when by the time the movie started, and with good reason too. The starting scene showed Snape walking into Voldemort’s meeting place; the Malfoy Manor has a ghoulish yet majestic look about it. There, Snape lets out the real plan of Harry’s final departure from his Uncle’s place in Privet Drive. Voldemort takes Lucius Malfoy’s wand, which he thinks would help him kill Harry. The meeting ends with Voldemort killing Charity Burbage, Hogwart’s former professor of Muggle Studies. The snake, Nagini, makes a delicious (eww!) dinner out of her. In the meantime, Harry has convinced his Uncle and Aunt to leave Privet Drive for good. While he is wandering about the empty house, Hermione, Ron, Fred, George, Lupin, Mad-Eye Moody and other members of the Order of the Phoenix turn up all of a sudden. After a brief squabble with Harry, Hermione rips off some of his hair and puts it in the Polyjuice potion. In minutes, seven Harrys appear in the place of the others. The ploy is an attempt to baffle Voldemort or his Death-Eaters in case anyone is out there. False trails had been leaked in the Ministry of Magic about the date and time of Harry’s departure. But someone has betrayed them, and they are surrounded by Death-Eaters. At this point, a number of changes have been made from the book. But the major points remain the same, and Harry (the real one) and Hagrid land in Ron’s house. One by one the rest of them appear, George with a ear cut off, and Hedwig and Mad-Eye dead. It is during Bill and Fleur’s wedding that the actual movie starts. With the Minister having been killed and the Ministry taken, the Death-Eaters attack. 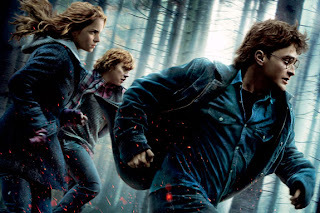 Ron, Harry and Hermione disapparate in a hurry, and thus begins their final adventure. By and large, the movie has stuck to the book. However, there are some theatrical adaptations. The feel of romance is much more prominent in the movie than in the book. It even has some elements of action thrillers. By the time Harry and Hermione had returned from Godric’s Hollow after their close encounter with Nagini, I was hyperventilating. A very nice part of the visual effects was when Hermione was reading out the story of the Three Brothers form The Tales of Beedle the Bard. The entire episode was shown in silhouettes, and a background of twilight added to the mystic nature of the show. I have always felt that the choice of actors for the Harry potter movies was excellent. After watching this movie, I am more than ever convinced that no one other than these very actors could have done better. Harry is just Harry, slightly headstrong, sometimes pushy, and usually faithful to friends, but with no well-defined talent or character as such. Ron is eternally awkward and very often ridiculous, but is probably the best kind of friend one can wish for. And Hermione! She just seems to grow prettier every day! She most characteristically carries books with her on the most life-threatening journey possible. Emma Watson has positively outshone herself in all the subtle expressions and feelings that keep flashing across her face throughout the movie. Other than these three, others have brought out their characters well, though most of this film circles around the trio. A new addition to the Harry potter crew is Rhys Ifans, who plays the role of Xenophilius Lovegood, Luna’s father. Had I not seen him act, I wouldn’t have believed that anyone could possibly act that eccentrically! Ralph Fiennes as Voldemort is quite fearsome. A lot of the credit would go to the make-up artists. They have positively done a good job. The problem with movies made from books is that a lot of the details have to be omitted. Little things which, apparently of no great consequence, have made Harry Potter what it is. For those who have read the books, and read them well, the movies are bound to be disappointing. Those who have laughed at every Weasley joke, sympathized with Ron when Hermione got mad with him and cried with them all at their slightest pain find the movies sadly lacking in such details. The last movie, though made in two parts, suffers from the same problem. Most parts of the movie plays in a dull gray morning background. The average spirit of the people has been very well brought out in the misty surroundings. The haunting music that sometimes rings in the background goes well with the general air of hopelessness and desolation that is closing in. Certain parts of the movie have been very well-directed, as in the portrayal of the hostile feelings growing in between Ron and the other two, and the last torture that Ron faced before he was able to destroy the locket horcrux. Even the part which shows Bellatrix Lestrange torturing Hermione was quite horrifyingly real. I could almost feel her pain myself. The most touching part of the movie is undoubtedly the death of Dobby. Dobby’s last sigh was ringing in my ears long after I left the movie hall. I think that J.K. Rowling has been unnecessarily cruel with Dobby. He should not have died. Not Dobby. The first part ends with Voldemort stealing the Elder wand from Dumbledore’s grave, and casting a powerful spell into the sky. Harry Potter movies have never been great by themselves. It is really the storyline that carries the entire thing off so decently. It is no different for this movie. But certainly, this one is an improvement when compared to The Half-Blood Prince. This movie is not one of the best movies that I have watched, but I would not have liked to give this one a miss either. The two hours spent at the cinema were not spent in vain. I will be waiting for the last part of this last movie eagerly. Let’s see how things turn out. Wow! It looks like you had a lot of fun :) I couldn't go last weekend because of the 'flu. I will be watching it the coming Sunday and I am very excited! I grew up reading Harry Potter and I was never more than maybe just a year or two older than Harry when the books were coming out. I was never fully satisfied by the movie adaptations of this series but there you go, it is Harry Potter. End of story. Sometimes I almost wish I didn't know what is there between those covers. The joy of reading this series for the first time is something I will never forget! I'm happy to know you watched the movie. I watched it last week as well - couldn't think of giving it a miss even though Yates' The Half-Blood Prince left a bad taste in my mouth. I was much relieved that he didn't drag out the forest drama (for some reason, every time I re-visit the book, that part seems to go on forever) and I'm completely with you on the lovely representation of the story of The Three Brothers. I miss some of the characters very badly so I'm waiting for the last movie. Every now and again, for no good reason, there's one bit of the last book I keep re-reading: it's the bit where Harry meets his death and meets Dumbledore. I wonder how Yates has directed that bit. And you're right. The movies are nowhere near the books - although it's true I've watched the first five movies more times than would be considered respectable. I'd better end this comment, for now, otherwise this will end up being a 'letter' instead of a comment. Like many others,I am an ex-student of your father who graduated 9 years back and recently met him when I went to Durgapur. I am more than happy to see the little kid I saw during our classes at your house has a beautiful mind of her own. So good to see you writing and expressing yourself so beautifully. All the very best for your adventure.